Dubai: Authorities expect a surge of customers in abattoirs during Ramadan and have urged by residents to abide by the municipality’s regulations to avoid the risk of food contamination. Food poisoning cases are more likely in summer since the hot and humid weather enables bacteria to grow at a faster rate, officials said. The advice came yesterday after a one-day seminar organised by the municipality’s public health services department in collaboration with Meat and Livestock Australia (MLA) on the preparation and processing of sheep meat to ensure optimal meat quality and hygiene. Officials at MLA pointed out that the top world beef producer in 2012 was the US with an output of 12 million tonnes, with Brazil coming in at second place with 9 million tonnes, while Australia was placed 7th with 2.5 million tonnes. 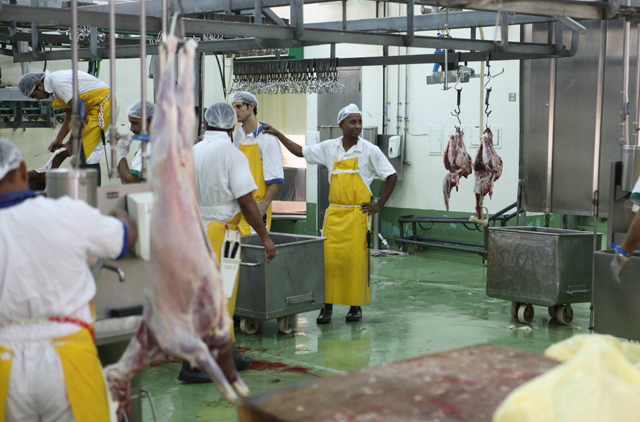 The municipality has clearly defined guidelines for individuals, companies and cooperatives making use of services provided by the abattoirs in Al Qusais, Hatta and Al Lisaily. “We have 10 veterinarians at the abattoir in Al Qusais who carry out ante-mortem and post-mortem checks on cattle, to ensure that they are slaughtered with clean knives and in a hygienic environment,” said Ahmad Hassan Al Shammari, head of the abattoirs section at Dubai Municipality. Al Shammari also warned of the dangers of residents slaughtering animals in their backyard as such practices could pose health risks and cause food contamination in the absence of proper supervision. “We aim to offer the best services to the public and are always warning residents not to rely on unauthorised individuals to slaughter animals. To encourage people to use the abattoirs, we have not changed the prices since 1989,” Al Shammari said. Abattoirs affiliated with Dubai Municipality collect nominal charges for slaughtering animals. People can get animals slaughtered by paying fixed charges according to the size of cattle. Sheep and goats are slaughtered for Dh15, while the rate is Dh30 for a calf, Dh35 for a medium size cow, Dh45 for a big cow, Dh60 for a medium size camel, and Dh65 for a big camel. The official said all machinery and accessories used for slaughtering animals in abbatoirs was sterilised and underwent necessary repairs and maintenance and hence was always the safer choice.